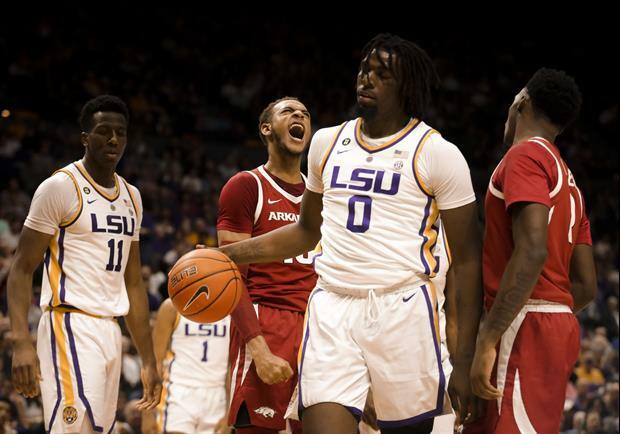 Per LSUSports.net: BATON ROUGE – The LSU Tigers overcame an 18-point deficit, but fell to the Arkansas Razorbacks late in a 90-89 game. LSU falls to 17-4 overall and 7-1 in SEC play. Arkansas improves to 13-8 and 4-4 in the SEC. The Tigers were led is scoring by freshman forward Naz Reid. He scored 19 and also picked up a game high 10 rebounds. Freshman guard Javonte Smart compiled 18 points. Junior guard Skylar Mays contributed 17 points, as well as two rebounds. Sophomore guard Tremont Waters scored 12. He also had eight rebounds and six assists. Up Next: LSU at Mississippi State on Wednesday, February 6 at 8 p.m. CT on ESPN2. It was only a matter of time. Efforts have not matched talent level. Hopefully this loss will help them refocus. We are a whisp away from being something special. Hogs shot unreal from the 3pt line. The atmosphere was great. If you haven't been to a game at the PMAC this year you owe it to yourself to go see this team. It hurts but we will come back. I think the team rebounds on the road at State and Auburn. UK & UTk not so sure if we play inconsistent like tonight. Was a great comeback, but should have won. Bad decisions at end cost them. Sure wish they could find a consistent 3-pt shooter, that was the difference in the game. I didn’t know LSU had a basketball program. What a dumb arse comment... Go troll somewhere else idiot. Gosh. Freaking stupid! Can't stop.... You're freaking stupid. I'm pissed you made that stupid comment. You got my blood boiling. Maybe I've had too much to drink at this point, but it doesn't change the fact that you are a moron and need to go swamp swimming. Come back did not fall short. They did not finish the game.